A ferry service in Hampshire is to be supported by a financial break from its harbour fees. The Hayling Ferry is the only ferry service between Hayling Island and Portsmouth. Since it was revived two years ago - after its previous operator went into administration - the service has struggled to sustain itself. The Langstone Harbour Board (LHB) has agreed to cut its fees by around half per passenger for a year. Last year the ferry service paid £23,000 to LHB in fees for pontoons and other facilities that it uses. Skipper Colin Hill said: "This will help us an awful lot. Anything that helps secure the ferry's future for everyone is good." Portsmouth company Baker Trayte Marine, which operates the ferry, previously reported the service was making a loss of £250 each day between November and March. It comes as connecting bus services are also set to be trialled to the ferry. From 24 September, First Solent will extend their number 15 service to the ferry landing area in Eastney for a six-month trial. A community bus will serve the Hayling side. 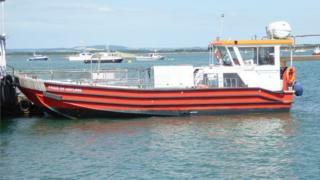 The three-minute ferry crossing avoids a 16-mile road journey between Hayling and Eastney. Campaigners raised more than £20,000 to relaunch the service in August 2016 after it shut down in March the previous year. The service has been running for more than 200 years.